This gallery is intended to be a sample of the type of work I have been involved with in past few years. The list is not comprehensive as export regulations prevent me from displaying results from other projects. Despite this, I feel this is a good cross-section of the phenomena I have spent my time studying and shows off my CFD capabilities well. 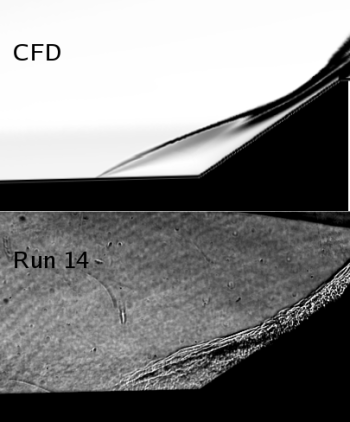 As these sample cases show, I place great emphasis on the validation of CFD solutions with experimental data. Additional details about many of these topics can be found in my published papers. I have spent a considerable effort in support of experimental studies of the Mars Science Laboratory (MSL) vehicle. This vehicle is a 70-degree sphere-cone capsule with a compound angle backshell similar to, but much larger than, previous missions to Mars including Viking, Pathfinder, and MER. 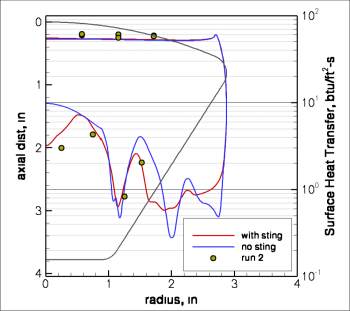 We have been involved in making measurements for the primary purpose of assessing transition onset and turbulent heating on the forebody of the heat shield. Mars has a carbon dioxide atmosphere, and we quickly learned that CO2 has several physical phenomena related to it that make it uniquely challenging to test in. The first physical phenomenon that I have dedicated considerable effort on this program is in assessment of catalytic heating. CO2 is difficult in that it has a large negative heat of formation compared to its constituents and at high enthalpy is strongly chemically reactive. 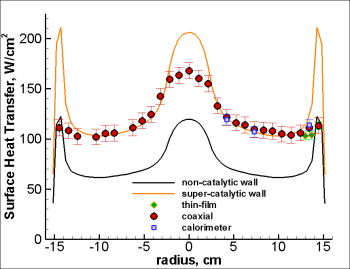 The degree acceleration of recombination on the surface is such that large differences occur between a non-catalytic versus a very catalytic surface (nearly a factor of two as shown left). 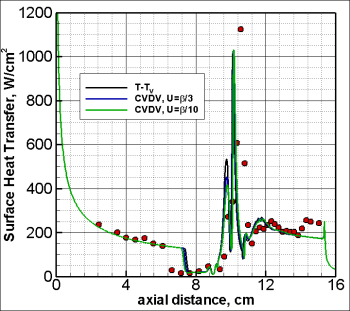 Here is an example where experiment and CFD must be coupled together as only by plotting the data against the limiting bounds predicted by the CFD can one assess the data. 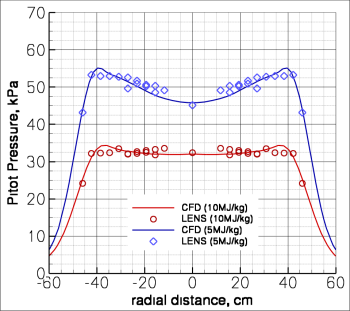 We have seen in many of our tests at LENS a high degree of catalysis that we have investigated with different types of instrumentation, different material surfaces, etc. 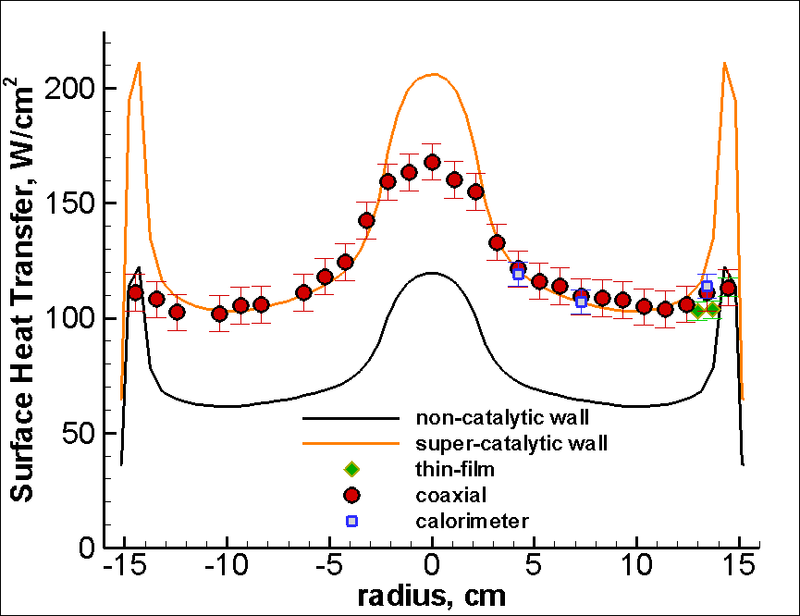 One on-going interest of mine is to develop physical models for these catalytic processes that explain the catalysis that we measure in the facility. 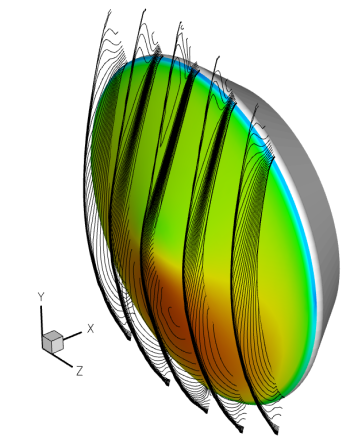 For spherical capsule (Apollo or Orion) development, I have done computations to support multiple studies of a generic capsule OML (based on the Apollo shape). I am involved in studies targeting radiation effects, real-gas effects, transition, wake flow structure, ablation, and surface roughness. 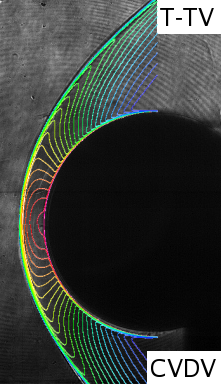 Left is a typical flowfield around a capsule at no angle of attack showing the shock patterns and wake structure. 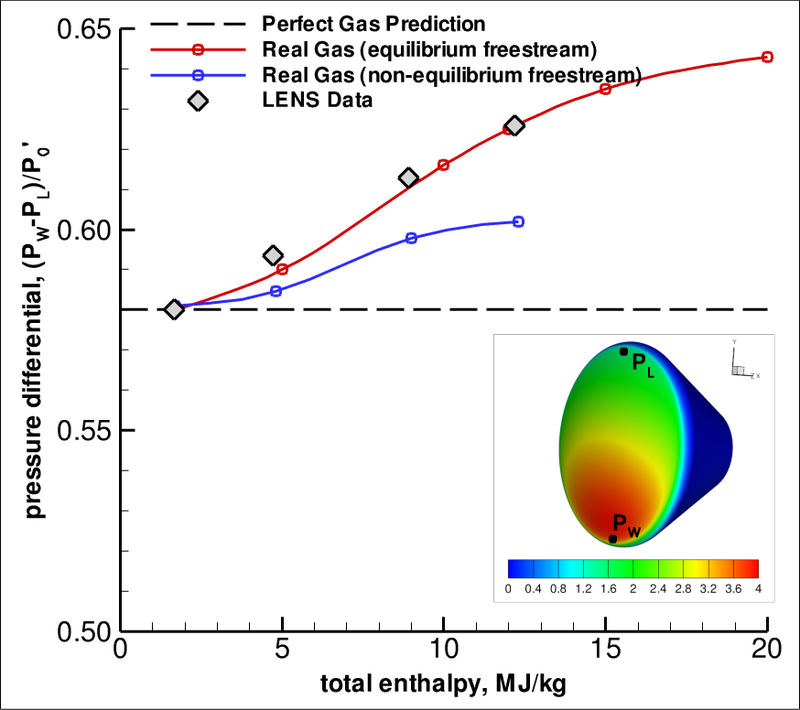 I have participated in studies of the effects of thermal and chemical excitation (real-gas) where we have measured a dimensionless pressure ratio on the capsule as a function of total enthalpy in the flow. 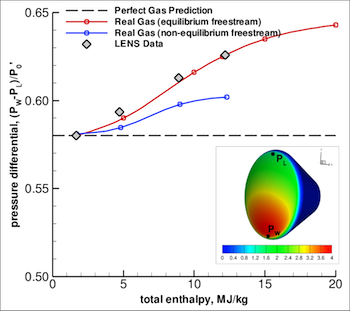 As part of our real-gas effects work, we have been interested in looking at shock shape and structure at high enthalpy where the shock changes in response to non-equilibrium both in the shock layer and in the freestream of the tunnel. 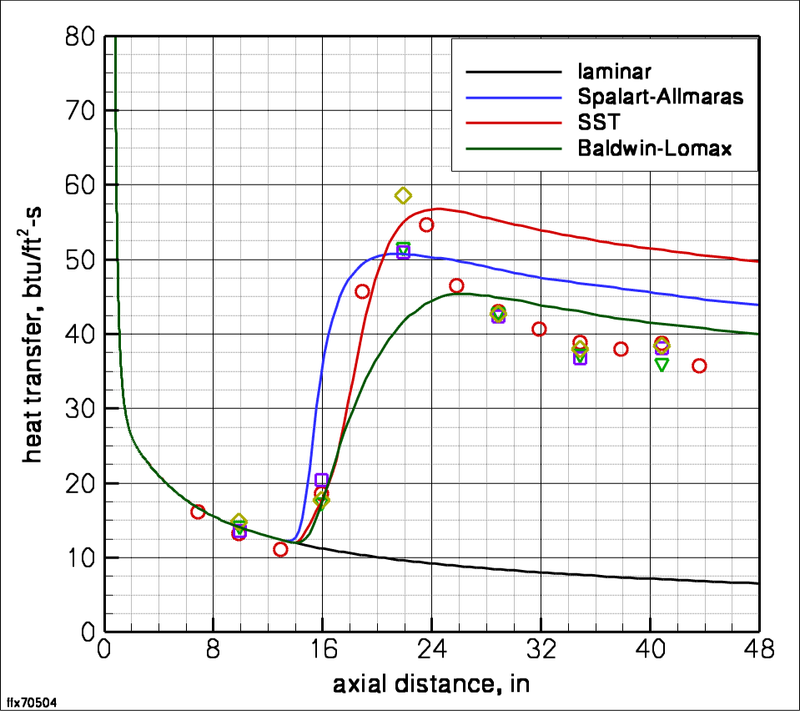 These results show how the flow expands around the leeward side of the forebody of the capsule in a non-equilibrium environment, which affects the aerodynamic stability of the capsule in flight. 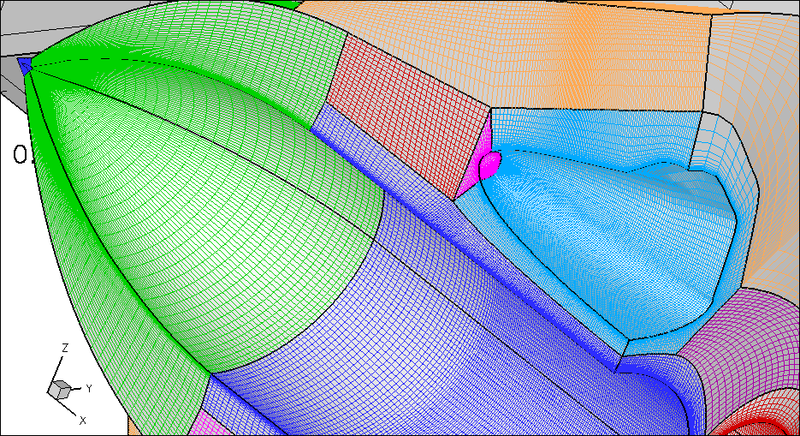 We have been able to correlate the experimental measurements very well with the CFD analysis. 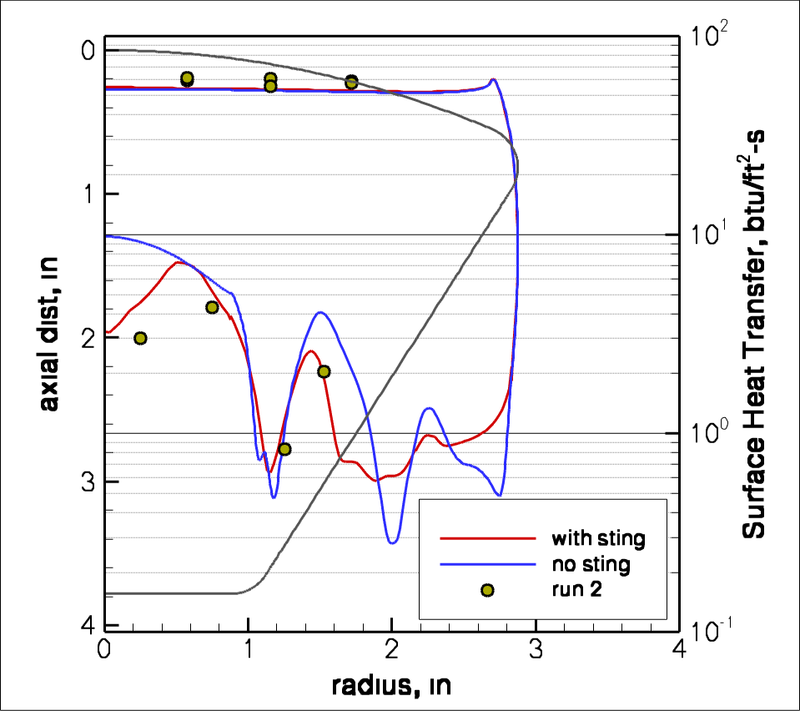 Shown here is forebody and aftbody heating predictions with and without sting effects included in the CFD calculation. For the capsule models, we have seen some effect of catalytic heating on the forebody, though not nearly as dramatic as in CO2 test gas. In the wake, the agreement with the data is a demonstration of my ability to grid complex structures to compute realistic results. Many aspects of our work studying the Shutle STS configuration were uniquely challenging. We have done extensive work both with the ascent and descent configurations and both represent some of the more difficult grids I have had to design. I design and create all my own grids as the example of the Shuttle OTS grid to the left shows. This grid was (I think) about 15 structured blocks with about 12 million grid cells (one tends to lose track of the exact count in the madness...). It was in fact about this time that I coded automatic zonal boundary detection into the DPLR code. This surface pattern shows the typical results obtained with grids like the one shown above. This case studied the Shuttle OTS configuration with SRB's and the main tank attached. Experimentally, we were studying the turbulent shock interaction region on the surface of the main tank, and the CFD prediction was utilized in near real-time to get a feel for the extent and driving influences on the separated region to analyze and compare to the experimental data. 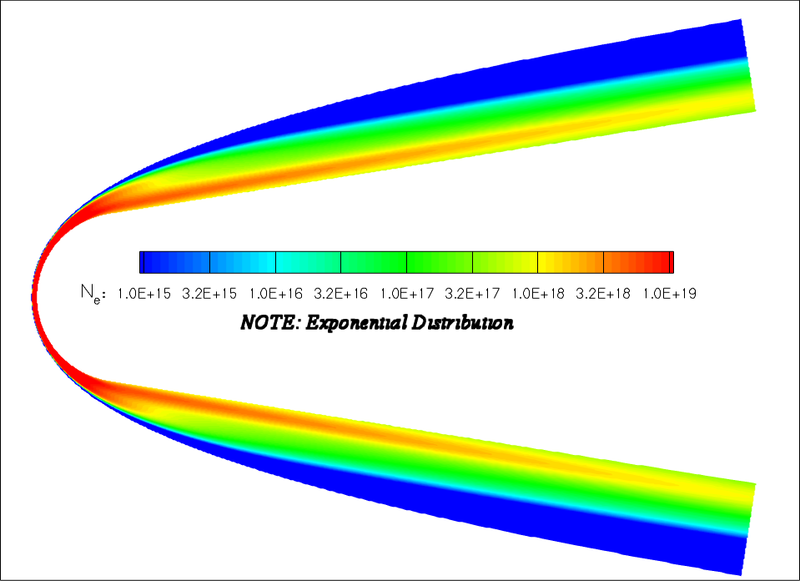 On descent, we have made extensive measurements of leading edge heating, transition and turbulent heating, and protuberance effectiveness testing for the STS heat shield. I have supported the experimental program with calculations to validate the data, size protuberances, and assess the flowfield over the measurements. I have supported extensive testing on the HIFiRE-1 ground tests to look at transition, turbulent heating and turbulent separation over a cone-cylinder-flare for an upcoming flight test program. 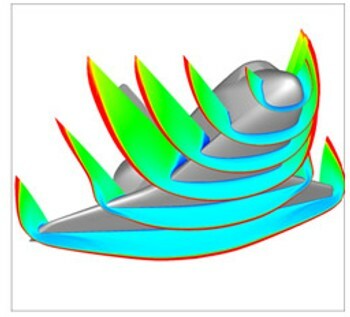 This work has included laminar mean flow CFD simulations, stability/transition prediction simulation, turbulent heating analysis, and turbulent shock/boundary-layer interaction simulation. 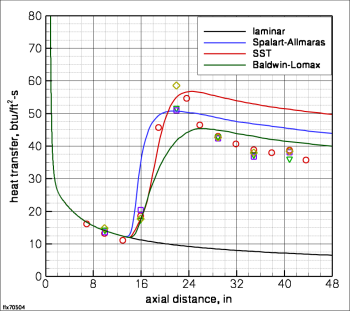 Left shows turbulent heating predictions for various RANS based models in hypersonic flow. There is a relatively wide band of solutions depending on the model chosen. 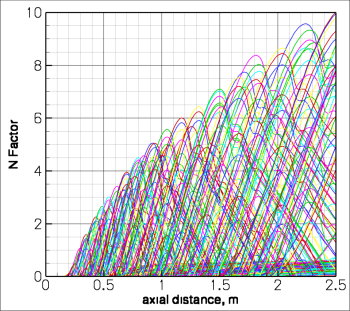 Researchers who have worked with RANS models know that there are lots of "tunable" coefficients and source term modifications designed to make the models perform well for one flowfield or another. 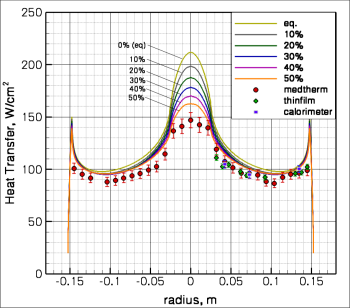 Part of my ongoing work is to work through these turbulent issues and develop an improved model that we can use to accurately predict our heating data. For the shock interaction, there are also various options to improve validation with experiment. Left I have shown a calculation I have done using the SST model, but with a stress-limiter term adapted for SST from Wilcox's work. The native SST model tends to predict much too large a separated region for these types of flows, but the inclusion of the stress limiter improves the prediction dramatically as verified by the experiment also shown. 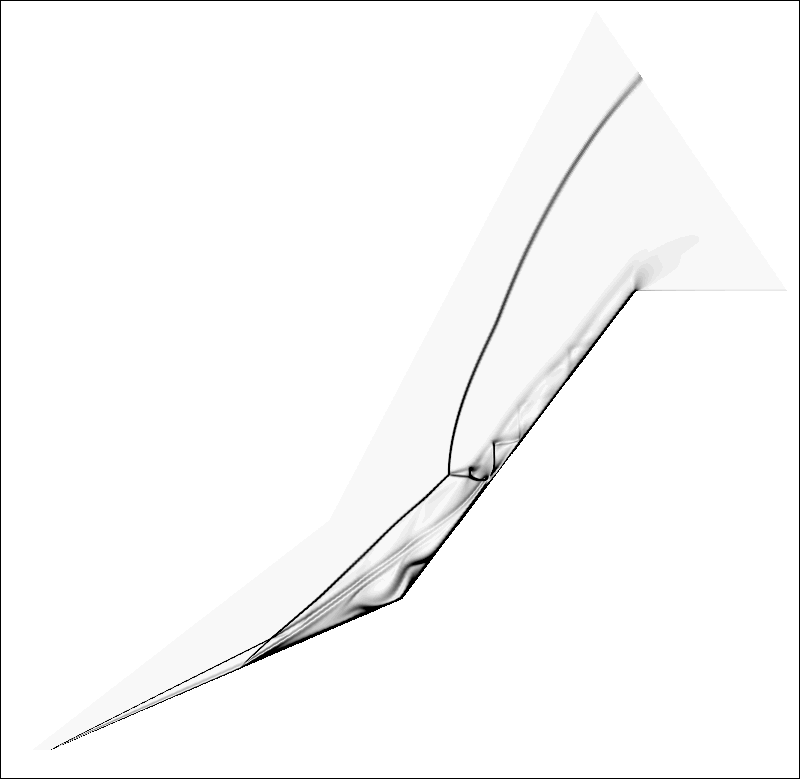 In addition to the meanflow CFD work I do, I also have a continuing interest in high-speed transition prediction. I have done significant work validating transition prediction with the STABL code (University of Minnesota). The STABL code solves the parabolized stability equations (PSE) for the growth of first-mode and second-mode disturbances. Using a chemically-reacting mean-flow solution, sets of test points are evaluated by marching downstream from an initial solution of linearized PSE equations. Each test point grows or decays depending on its compatibility with the 1st or 2nd eigenmode of the laminar flow. The resulting growth (plotted left) shows the waves grow according to their degree of instability. The wave(s) of maximum instability define the likelihood of transition, where the integration of the streamwise wave number is correlated to an empirical e^N fit. 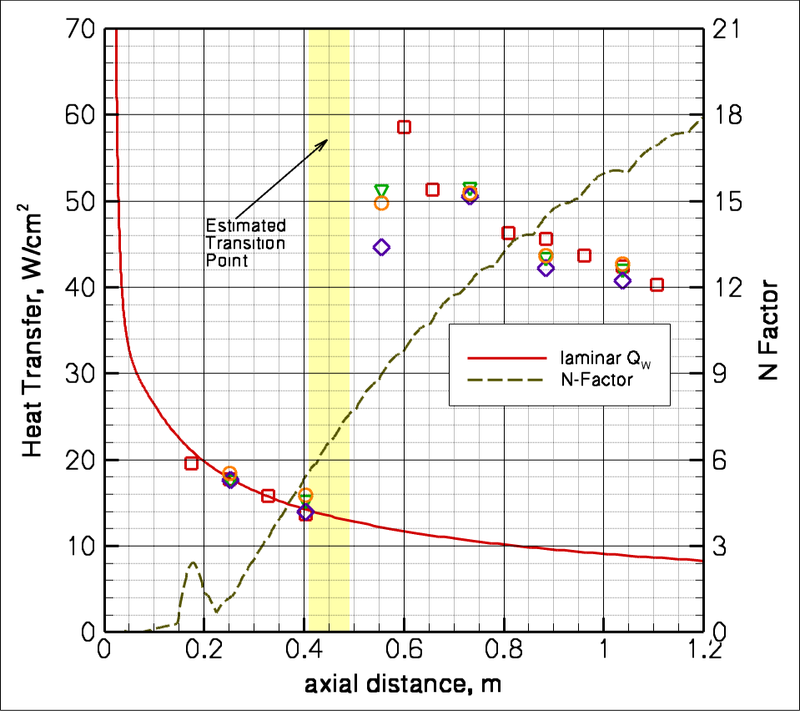 Pure experience has shown that N=10-12 correlates transition onset well for a variety of flows on flight vehicles, with somewhat lower values expected for wind tunnels. 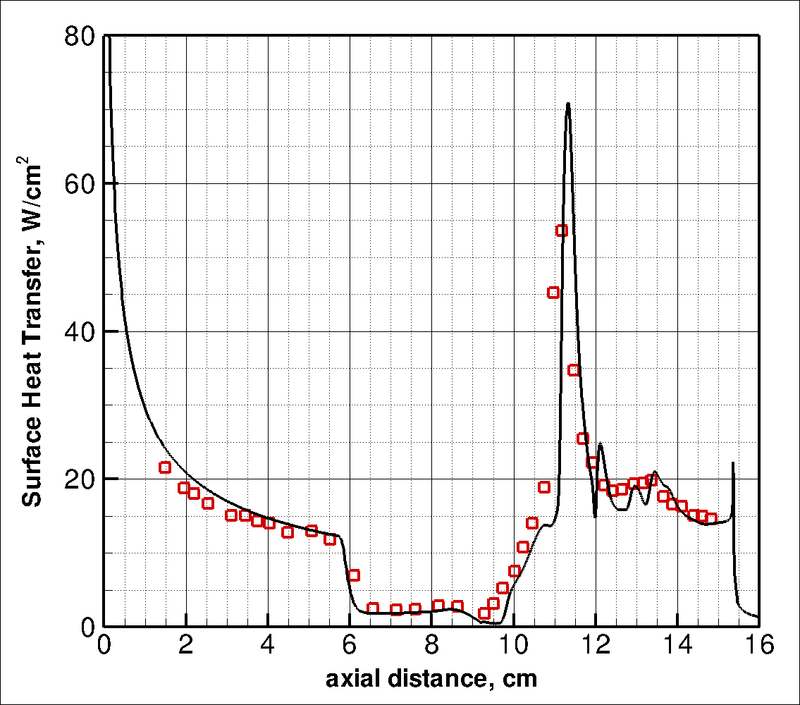 A major part of my work in this area focuses on analyzing experimental data to understand the transition onset process and to correlate to the PSE solution as shown left where the measurement of surface heat transfer is used to determine measured onset. Despite its geometric simplicity, the double cone is one of the most complex flows in hypersonic aerothermodynamics. The compound angle creates a complex shock-interaction region where a change in the size of the separated region changes the angles of the intersecting shocks whch in turn changes the size of the separated region further. 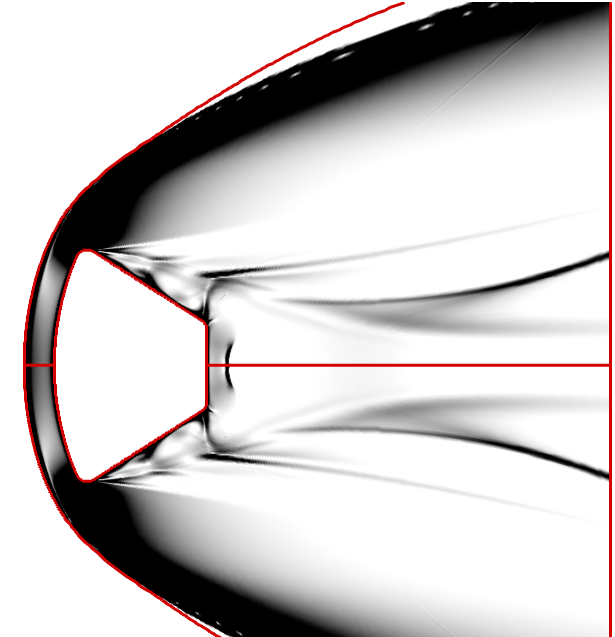 The computational Schlieren image to the left details all the shock interactions that occur in this type of flow. 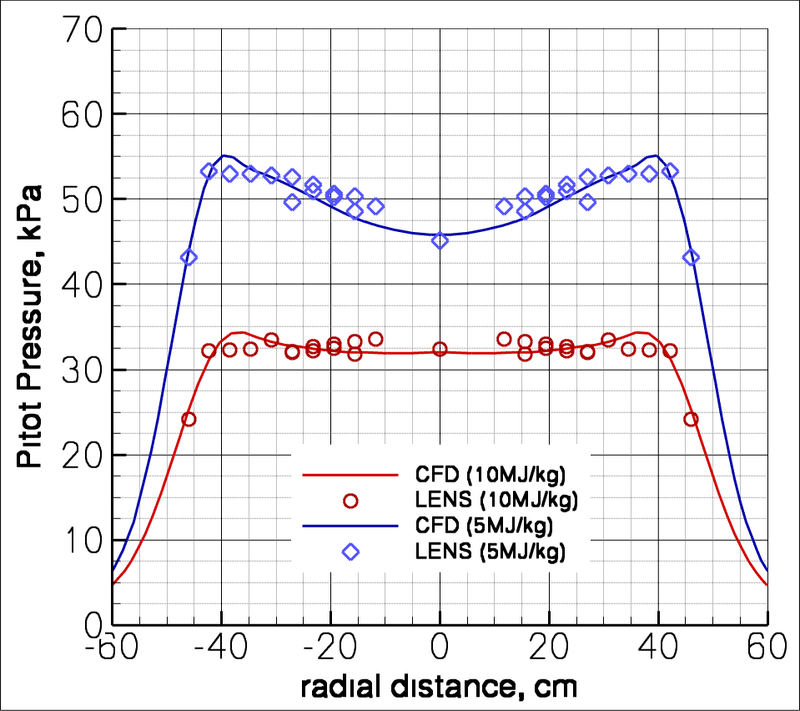 With quality experimental datasets generated at the LENS facilities in past few years, the double cone is one of the most strenuous code validation exercises. After several years work by a team of dedicated people (see here for one of them), good agreement can be obtained for low enthalpy gas cases. As shown left, these solutions require the combination of accurate numerics (dissipative numerics tend to predict too small a separated region), vibrational-nonequilibrium effects, and a very fine grid (think 250K cells minimum for an axisymmetric flow). The heating on the forebody shows a small discrepency due to vibrational accommodation that improved modeling has shown to capture accurately. At high enthalpy, where we have chemically and thermally active flows, agreement is much more elusive. We have been working at this problem for several years and still have not resolved all aspects of the problem. Application of the lessons learned in the low enthalpy flow helps, but discrepencies with the measured data remain. In part, the thermal state of the freestream gas may be an issue. 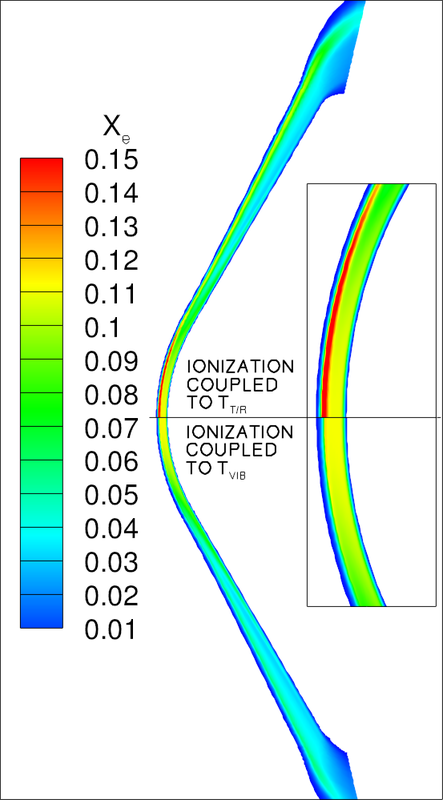 I have also done some preliminary exploration of vibration-dissociation coupling in the separated region. While this case shows little sensitivity to the coupling model, other conditions show more proounced differences. It is clear that more work needs to be done with this flow before it is understood. 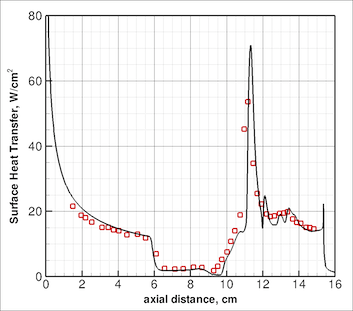 The 2D cylinder is a fundamental shape that we use to investigate thermochemical ("real-gas") effects of high enthalpy air and validate facility operation. We have made Schlieren measurements of shock shape in the non-equilibrium flowfield and compared to computed solutions. 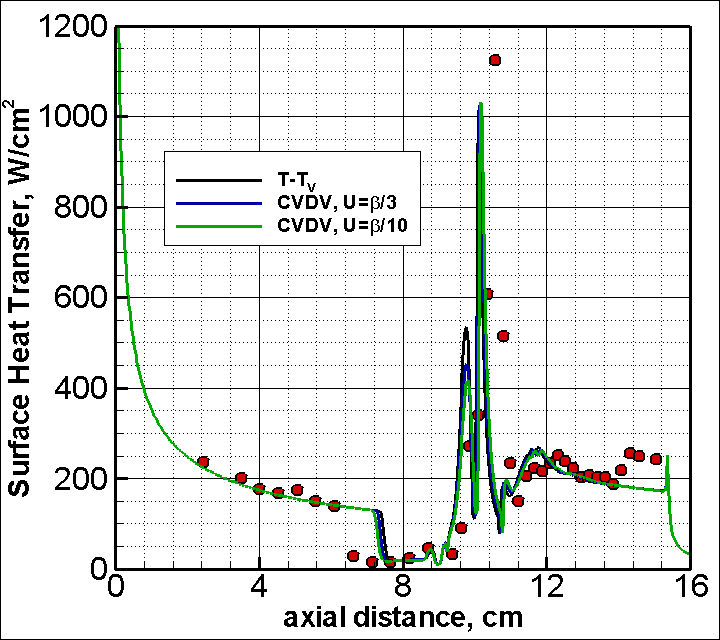 Here, I have simulated 10MJ/kg air with two different vibration-dissociation coupling models -- CVDV and Park/T-Tv. Although I saw at least some effects on the double cone geometry, the shock shape predicted by both models matches the measured shape accurately. 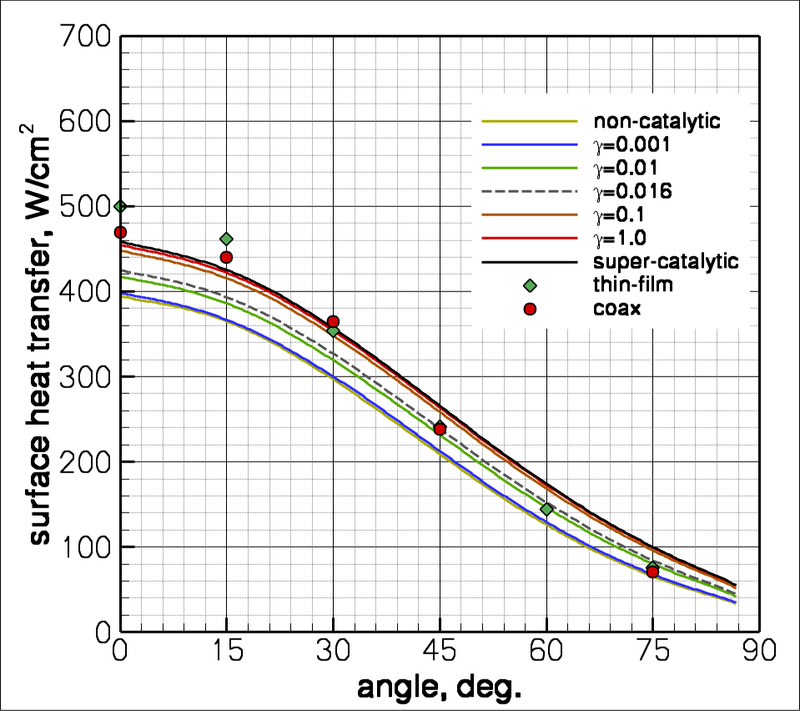 The effect of catalytic heating on the model, however, is less clear. As in the case of the CO2 testing, we measure significant catalytic heating on the models in air. Although the percentage of catalytic heating compared to the total is less than it was for CO2, the level is significant. 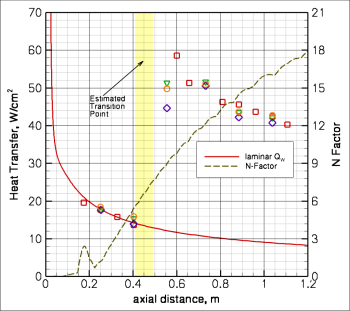 The model predicting full-catalytic recombination (this time to pure O2/N2) again matches best in the stagnation region, though there is evidence that the level of recombination falls off as a function of angle on the cylinder. 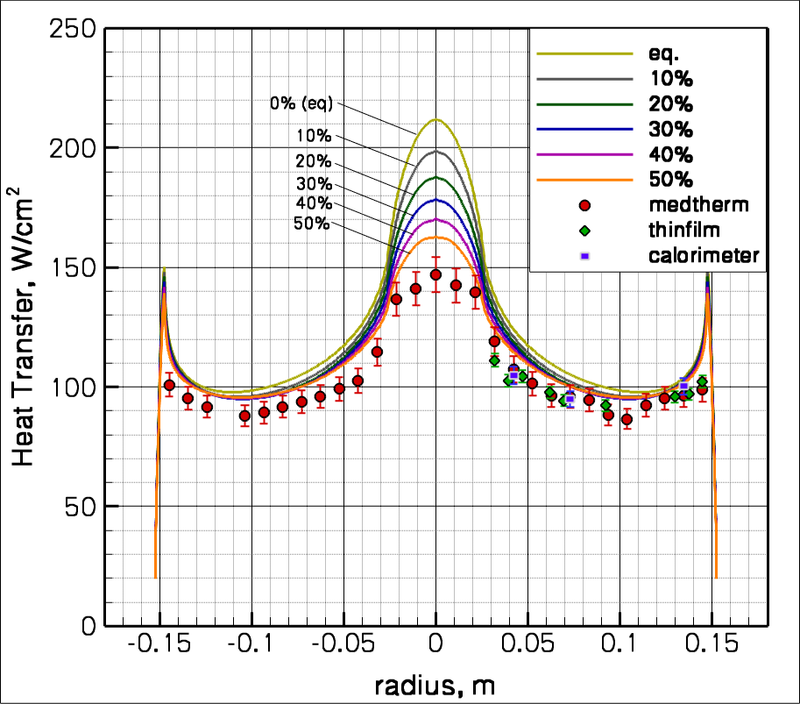 None of the constant efficiency rate models predict the heating pattern accurately. As part of my work to design experiments for the shock-tunnels, I have analyzed experiments such as RAM-C and Stardust where ionization plays a critical role in the performance of the vehicle. For vehicles such as RAM-C, accurate characterization of the electron field in the shock layer are necessary to predict communication attenuation and blackout. 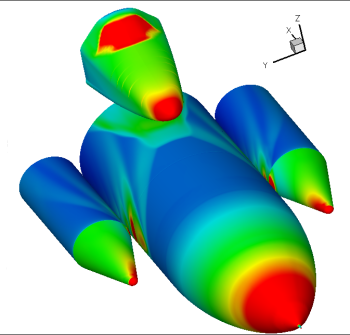 For a high velocity reentry at 11.5 km/s such as the Stardust vehicle experienced, the coupling of the electron formation to the thermodynamic state of the heavy articles can have dramatic effects on flowfield features such as radiation heating to the vehicle surface. One of my most fundamental tasks is facility validation. I simulate the facility itself to assess flow quality, check out new conditions, design upgraded components, etc. Here, I have compared to measured Pitot pressure profiles at 5MJ/kg and 10MJ/kg. 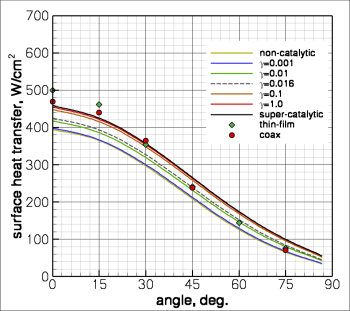 Pitot pressure is the first measure of facility validation. We have also compared to hemisphere probes, compared to shock shapes on fundamental geoemtries, and compared to non-intrusive diagnostics measurements of species density, temperatures, and flow velocity as part of this work.